Lapdog Creations: Reduce. Reuse. Rewoof! Happy Earth Day! As we say around here, Reduce. Reuse. Rewoof! I'm a huge fan of Planet Dog and always love when the Lapdogs get to review their wonderful products (stay tuned for one next week). 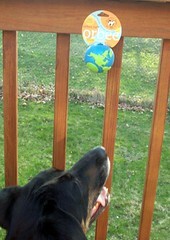 For Earth Day 2009, we had three very special guest reviewers help us show off some of their go green items... you can revisit the review here. 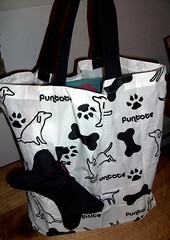 Another favorite "green" thing of mine is reusable shopping totes. We've got a huge stack of the freebie style ones at home and I'm doing better at making a conscious effort to always have them in my car. I especially love how I can fit 3 or 4 plastic shopping bags worth of stuff into one easy to carry tote. For non-grocery things, I really love the fancier ones that fold up into little pouches, making them easy to stash in your purse, especially the Funtote Carry-Me bag or the Goknit Green bag. 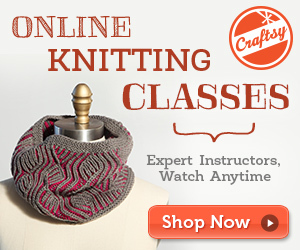 These are perfect for fiber festivals, fairs, day trips, etc. Anyone doing anything special for Earth Day? Any festivals or fairs near you? If you hop over to Lowe's tomorrow, they're giving away one million free trees... who's getting one? Have a Happy Easter weekend! I hope everyone gets something yummy in their basket.... 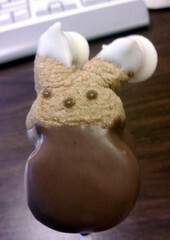 I'm hoping for some more of these awesome chocolate mousse flavored "peep" pops. I grabbed one while shopping at The Chocolate Moose (sadly, they don't have a website) yesterday and all I can say is..... yum-o!!!! 1. Pardon me, but who are you to question what I do in my free time. 2. The Sperry Top-sider Sunfish flip flops I ordered yesterday were a good deal at 50% off (and free shipping!). 3. I was surprised to find that I really like brussel sprouts. 4. People watching is one of my favorite forms of entertainment. 5. Hi, my name is Nichole and I'm a yarn hoarder. 6. Having to be at work on beautiful summer afternoons is no fun at all. 7. And as for the weekend, tonight I'm looking forward to the start of the weekend, tomorrow my plans include B's vs Habs Game 5 and Sunday, I want to enjoy a quiet Easter at home with the family! Cute tote. But is that a "stick out" bone near the bottom? My word verification was "rediced"
Happy Earth Day - Easter, too!!! we too have become big brussel sprout converts too!!! I love that tote. Thanks for the tip about Lowes. We're only a couple miles from one, so we'll stop by and get a tree. never enough trees. Yes, it's very important for all species to come together to make sure the Earth is in the best shape ever. The peep looks super delicious toO! I'm pretty sure that plastic bags multiply if left alone, so the reusable ones are definitely the way to go.